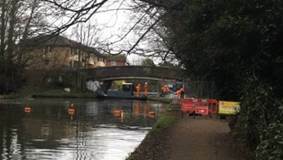 At Durrant’s Hill Canal Bridge, the Osborne team are carrying out an environmentally sensitive refurbishment in a picturesque setting to very tight timescales. Having previously completed Phase 1 of the project to waterproof and resurface the top of the single span structure, Phase 2 now includes stripping back and repainting the steelwork, brickwork repairs and resealing of joints. But with the original paint being lead based and the structure being located over a navigable canal – this scheme was certainly not without a few technical challenges. The structure had to be fully encapsulated, and include a comprehensive extraction and temperature control system before work could begin; and the canal was only allowed to be closed for a maximum duration of five weeks. No mean feat! Just three working days into the New Year and the site set-up was installed in an impeccable manner and the canal and towpath closed ready for the work to begin. The team worked collaboratively with UKPN who were working adjacent to them, and re-used material was used to protect the ground and provide a walkway from the compound to the works area. The bridge was also encroached by the garden of the adjacent property and considerate arrangements had to be made to temporarily remove part of the boundary to carry out the works. The scaffold was transported over the canal by boat and firmly fixed to the abutment walls ready for the full encapsulation. The scaffolding beams were fully decked to seal even the smallest of gaps to ensure no grit or other debris could enter the canal below. The steelwork was grit blasted, primed and painted, with each of the 8000 rivets painstakingly painted by hand.